Here is an interesting map I found Online about the Socio-Cultural space of NdiIgbo and our Ibibio neighbors in SE Nigeria. Interestingly, this was FIRST PUBLISHED in 1950, and later, republished in 1962. I will also be posting further findings from the Publication here. Interestingly, the Ette township in Northern tip of Enugu state are not identified as Igbo. Anybody knows more about this locality? (Etteh or Ette in Enugu) in I believe Igbo Eze North local government. Next I will post the origins of each of the clans I can find. I love this as a historian. You love historical maps abi? 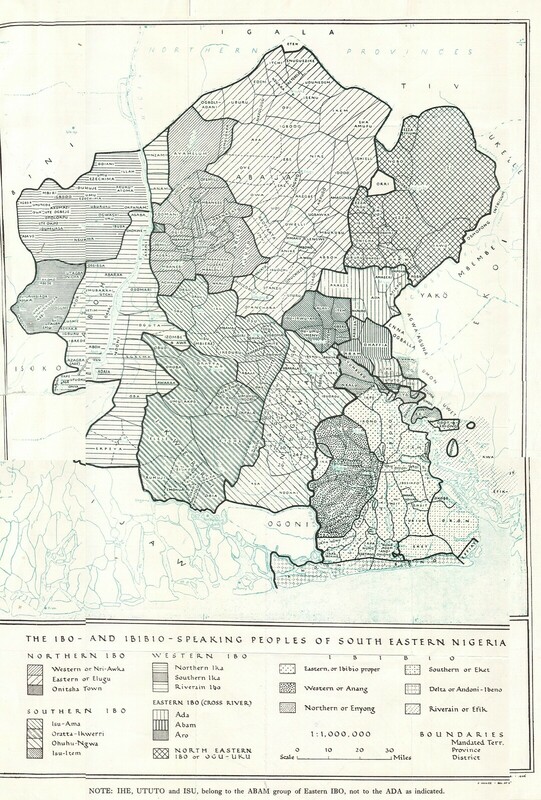 Eziokwu, is there a pdf of the book you got that map from? If yes, can you share? Thank you. About Etteh, it is an ethnically heterogeneous unit. The predominant ethnicity there is Idoma; the Igala come second; there are some Igbos there as well. I think there is an on-going tussle between Enugu State and Kogi State about where the community should really belong. Please OP, where did you get that map from? The accuracy is astonishing. Just that for some reasons, I can't see Igbanke communities there. Ette is an Nsukka town that got invaded in precolonial Times by Igala and Idoma elements, overwhelming the Igbo aboriginals in the process and tipping the balance of the ethnic composition of the community towards Idoma. But the Igbo aboriginals are still present and holding forte. The Idoma elements had also shown eagerness to assimilate into the Igbo culture, but it's the Igala minority elements that feels cheated out and are hell bent on "Igalanizing" the community by taking it to Olamboro LGA of Kogi state, an Igala LGA. Go through lordlexy posts there, he is a native of the town, I use to have issues with him as he wasnt Igbophillic enough for my liking, didn't even notice he had left NL, chai! Etteh is in Igbo eze north Enugu state. It is made up of Igalas and Igbos. We are not in disagreement. Except that you didn't mention the largest language group in the area. Ette is in Enugu ezike, all part of larger Nsukka. The Igbos and the Igalas are the largest respectively. I have been a teacher at CSS Umuopu. The town next to Etteh. There is at least one study done on the population demographic of Etteh by an academic (who happens to be Igbo) that says you are wrong. You are free to believe whatever you like. I would like you to talk to Enugu Ezike people in Igboeze north Enugu State. I would rather talk to Ette people themselves. Or at least, a trained observer who had gone into Ette community and conducted a professional ethnolinguistic study of the people. Someone like Martha Chidinma Egenti of the Department of Linguistics, Nnamdi Azikiwe University, Awka. Egenti is not a name you get in Etteh. Do a thorough study from the people themselves. Etteh is a town in Enugu Ezike. Ette is not in Enugu Ezike. Ette borders Enugu Ezike. And I didn't say the writer was from Etteh. You probably didn't even click on the link, which is okay. I wasn't really expecting you to. The problem with her article is that her ratios were gotten only from a sample of 36 persons or so, out of nearly 20,000 estimated Etteh population. I find her result selective and not representative of the entire group. There is bias in her research. For example, I could interview a handful of English-speaking kids in Lagos and conclude that all Nigerian kids are English speaking, which we know is not true. Her research is inconclusive and should not be used to evaluate the language speaking ratio of all Etteh indigenes. The village names of Etteh, surprisingly, appear to be Igbo. Reviving this thread of mine. I like how the map group cluster of Igbo dialects together according to speaking patterns. I.e Oguta in Imo and Ndokwas in Delta apparently speak something very similar. I agree. The Umunze dialect of Anambra sounds very 'Enuguish' and that is where Flavour N'Abania is from, thus he is able to switch between an Enuguish dialect (another influence being that he was born and bred in Enugu) and the 'general Anambra/Onitsha dialect' in his songs.